Convenience macro to set the icon object in a layout that follows the Elementary naming convention for its parts. Convenience macro to get the icon object from a layout that follows the Elementary naming convention for its parts. Convenience macro to set the end object in a layout that follows the Elementary naming convention for its parts. Convenience macro to get the end object in a layout that follows the Elementary naming convention for its parts. A layout part aliasing (proxying) description, used to get part names aliasing independently of a widgets theme. A Layout is a direct realization of The Elementary Layout Class. This is a container widget that takes a standard Edje design file and wraps it very thinly in a widget. An Edje design (theme) file has a very wide range of possibilities to describe the behavior of elements forming a layout. Check out the Edje documentation and the EDC reference to get more information about what can be done with Edje. Just like List, Box, and other container widgets, any object added to the Layout will become its child, meaning that it will be deleted if the Layout is deleted, moved if the Layout is moved, and so on. 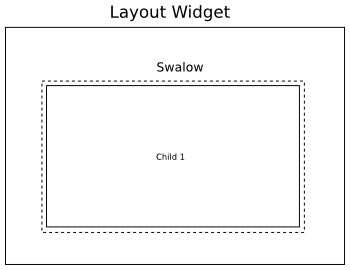 The layout widget may contain as many parts/children as described in its theme file. Some of these children can have special types, such as content holder ones (swallow spots), boxes or tables. These are parts meant to contain others. For instance, objects can be added to different table parts by specifying the respective table part names. The same is valid for swallows and boxes. Only one object can be added to the SWALLOW part at a time (but you still can have many SWALLOW parts and one object on each of them). Use the elm_layout_content_set()/get/unset functions to set, retrieve and unset objects as content of the SWALLOW. After being set to this part, the object's size, position, visibility, clipping and other description properties will be totally controlled by the description of the given part (inside the Edje theme file). One can use evas_object_size_hint_* functions on the child to have some kind of control over its behavior, but the resulting behavior will still depend heavily on the SWALLOW part's description. The Edje theme also can change the part description, based on signals or scripts running inside the theme. This change can also be animated. All of this will affect the child object set as content accordingly. The object's size will be changed if the part size is changed, it will animate moving accordingly if the part is moving, and so on. An Edje BOX part is very similar to the Elementary Box widget. It allows one to add objects to the box and have them distributed along its area, accordingly to the specified layout property (now by layout we mean the chosen layouting design of the Box, not the layout widget itself). A similar effect for having a box with its position, size and other things controlled by the layout theme would be to create an Elementary Box widget and add it as content in a SWALLOW part. The main difference to that, by using the layout box instead, is that its behavior, like layouting format, padding, align, etc., will all be controlled by the theme. This means, for example, that a signal could be sent to the layout's theme (with elm_layout_signal_emit()) and the signal be handled by changing the box's padding, or alignment, or both. Using the Elementary Box widget is not necessarily harder or easier, it just depends on the circumstances and requirements. The layout box can be used through the elm_layout_box_* set of functions. Just like the Box (BOX part), the layout table is very similar to the Elementary Table widget. It allows one to add objects to the table by specifying the row and column where the object should be added, and any column or row span, if necessary. Again, we could have this design by adding a table widget to a SWALLOW part, using elm_layout_content_set(). The same difference happens here when choosing to use the layout table (a TABLE part) instead of the table in a SWALLOW part. It's just a matter of convenience. The layout table can be used through the elm_layout_table_* set of functions. Another interesting thing about the layout widget is that it offers some predefined themes that come with the default Elementary theme. These themes can be set by the call elm_layout_theme_set(), and provide some basic functionality depending on the theme used. Most of them already send some signals, some already provide a toolbar or back and next buttons. "theme,changed" - The theme was changed. Append child to layout box part. Once the object is appended, it will become child of the layout. Its lifetime will be bound to the layout, whenever the layout dies the child will be deleted automatically. One should use elm_layout_box_remove() to make this layout forget about the object. part the box part to which the object will be appended. child the child object to append to box. 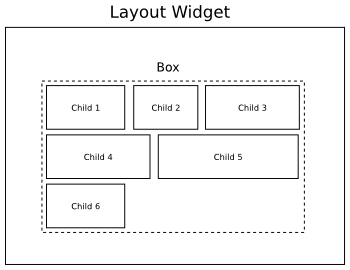 Insert child to layout box part at a given position. Once the object is inserted, it will become child of the layout. Its lifetime will be bound to the layout, whenever the layout dies the child will be deleted automatically. One should use elm_layout_box_remove() to make this layout forget about the object. part the box part to insert. child the child object to insert into box. pos the numeric position >=0 to insert the child. 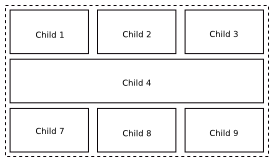 Insert child to layout box part before a reference object. reference another reference object to insert before in box. Prepend child to layout box part. Once the object is prepended, it will become child of the layout. Its lifetime will be bound to the layout, whenever the layout dies the child will be deleted automatically. One should use elm_layout_box_remove() to make this layout forget about the object. part the box part to prepend. child the child object to prepend to box. Remove a child of the given part box. The object that was being used, or NULL if not found. The object will be removed from the box part and its lifetime will not be handled by the layout anymore. This is equivalent to elm_layout_content_unset() for box. part The box part name to remove child. child The object to remove from box. Remove all children of the given part box. The objects will be removed from the box part and their lifetime will not be handled by the layout anymore. This is equivalent to elm_layout_box_remove() for all box children. clear If EINA_TRUE, then all objects will be deleted as well, otherwise they will just be removed and will be dangling on the canvas. Get the edje data from the given layout. This function fetches data specified inside the edje theme of this layout. This function return NULL if data is not found. In EDC this comes from a data block within the group block that obj was loaded from. E.g. This returns the edje object. It is not expected to be used to then swallow objects via edje_object_part_swallow() for example. Use elm_layout_content_set() instead so child object handling and sizing is done properly. This function should only be used if you really need to call some low level Edje function on this edje object. All the common stuff (setting text, emitting signals, hooking callbacks to signals, etc.) can be done with proper elementary functions. Get accessibility state of texblock(text) parts in the layout object. EINA_TRUE, if all textblock(text) parts in the layout can be accessible EINA_FALSET if those cannot be accessible. If obj is not a proper layout object, EINA_FALSE is returned. Add a new layout to the parent. [in] part the box part to which the object will be appended. [in] child the child object to append to box. [in] part the box part to insert. [in] child the child object to insert into box. [in] pos the numeric position >=0 to insert the child. [in] reference another reference object to insert before in box. [in] part the box part to prepend. [in] child the child object to prepend to box. [in] part The box part name to remove child. [in] child The object to remove from box. [in] clear If EINA_TRUE, then all objects will be deleted as well, otherwise they will just be removed and will be dangling on the canvas. Get the child object in the given content part. Once the content object is set, a previously set one will be deleted. If you want to keep that old content object, use the elm_layout_content_unset() function. 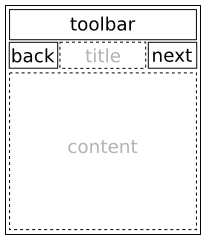 In an Edje theme, the part used as a content container is called SWALLOW. This is why the parameter name is called swallow, but it is expected to be a part name just like the second parameter of elm_layout_box_append(). Get the list of swallow parts of a given container widget. Unparent and return the content object which was set for this part. Set accessibility to all texblock(text) parts in the layout object. EINA_TRUE on success or EINA_FALSE on failure. If obj is not a proper layout object, EINA_FALSE is returned. Set the file that will be used as layout. Get a specific cursor engine_only for an edje part. whenever the cursor is just provided by engine or also from theme. [in] part_name a part from loaded edje group. Sets if the cursor set should be searched on the theme or should use the provided by the engine, only. before you set if should look on theme you should define a cursor with elm_layout_part_cursor_set(). By default it will only look for cursors provided by the engine. EINA_TRUE on success or EINA_FALSE on failure, that may be part not exists or it did not had a cursor set. Get the cursor to be shown when mouse is over an edje part. Sets a specific cursor for an edje part. EINA_TRUE on success or EINA_FALSE on failure, that may be part not exists or it has "mouse_events: 0". Get a specific cursor style for an edje part. the theme style in use, defaults to "default". If the object does not have a cursor set, then NULL is returned. Sets a specific cursor style for an edje part. Unsets a cursor previously set with elm_layout_part_cursor_set(). [in] part_name a part from loaded edje group, that had a cursor set with elm_layout_part_cursor_set(). Add a callback for a (Edje) signal emitted by a layout widget's underlying Edje object. This function connects a callback function to a signal emitted by the underlying Edje object of obj. Globs are accepted in either the emission or source strings (see edje_object_signal_callback_add()). [in] func The callback function to be executed when the signal is emitted. [in] data A pointer to data to pass in to the callback function. Remove a signal-triggered callback from a given layout widget. The data pointer of the signal callback (passed on elm_layout_signal_callback_add()) or NULL, on errors. This function removes the last callback attached to a signal emitted by the undelying Edje object of obj, with parameters emission, source and func matching exactly those passed to a previous call to elm_layout_signal_callback_add(). The data pointer that was passed to this call will be returned. [in] func The callback function being executed when the signal was emitted. Send a (Edje) signal to a given layout widget's underlying Edje object. This function sends a signal to the underlying Edje object of obj. An Edje program on that Edje object's definition can respond to a signal by specifying matching 'signal' and 'source' fields. Manually forces a sizing re-evaluation. This is useful when the minimum size required by the edje theme of this layout has changed. The change on the minimum size required by the edje theme is not immediately reported to the elementary layout, so one needs to call this function in order to tell the widget (layout) that it needs to reevaluate its own size. The minimum size of the theme is calculated based on minimum size of parts, the size of elements inside containers like box and table, etc. All of this can change due to state changes, and that's when this function should be called. Also note that a standard signal of "size,eval" "elm" emitted from the edje object will cause this to happen too. Request sizing reevaluation, restricted to current width and/or height. Useful mostly when there are TEXTBLOCK parts defining the height of the object and nothing else restricting it to a minimum width. Calling this function will restrict the minimum size in the Edje calculation to whatever size it the layout has at the moment. Remove all the child objects of the given part table. The objects will be removed from the table part and their lifetime will not be handled by the layout anymore. This is equivalent to elm_layout_table_unpack() for all table children. [in] part The table part name to remove child. 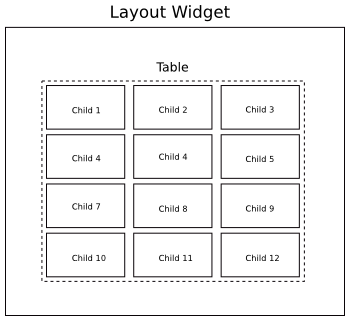 Insert child to layout table part. Once the object is inserted, it will become child of the table. Its lifetime will be bound to the layout, and whenever the layout dies the child will be deleted automatically. One should use elm_layout_table_unpack() to make this layout forget about the object. [in] part the box part to pack child. [in] child the child object to pack into table. Unpack (remove) a child of the given part table. The object will be unpacked from the table part and its lifetime will not be handled by the layout anymore. This is equivalent to elm_layout_content_unset() for table. [in] child The object to remove from table. Get the text set in the given part. Set the text of the given part. Set the edje group from the elementary theme that will be used as layout. Note that style will be the new style of obj too, as in an elm_object_style_set() call. Referenced by elm_layout::box_append(), and elm_layout_box_append(). Referenced by elm_layout::box_insert_at(), and elm_layout_box_insert_at(). Referenced by elm_layout::box_insert_before(), and elm_layout_box_insert_before(). Referenced by elm_layout::box_prepend(), and elm_layout_box_prepend(). Referenced by elm_layout::box_remove(), and elm_layout_box_remove(). Referenced by elm_layout::box_remove_all(), and elm_layout_box_remove_all(). Referenced by elm_layout::data_get(), and elm_layout_data_get(). Referenced by elm_layout::edje_get(), and elm_layout_edje_get(). Referenced by elm_layout::edje_object_can_access_get(), and elm_layout_edje_object_can_access_get(). Referenced by elm_layout::edje_object_can_access_set(), and elm_layout_edje_object_can_access_set(). Referenced by elm_layout_part_cursor_engine_only_get(), and elm_layout::part_cursor_engine_only_get(). Referenced by elm_layout_part_cursor_engine_only_set(), and elm_layout::part_cursor_engine_only_set(). Referenced by elm_layout_part_cursor_get(), and elm_layout::part_cursor_get(). Referenced by elm_layout_part_cursor_set(), and elm_layout::part_cursor_set(). Referenced by elm_layout_part_cursor_style_get(), and elm_layout::part_cursor_style_get(). Referenced by elm_layout_part_cursor_style_set(), and elm_layout::part_cursor_style_set(). Referenced by elm_layout_part_cursor_unset(), and elm_layout::part_cursor_unset(). Referenced by elm_layout_signal_callback_add(), and elm_layout::signal_callback_add(). Referenced by elm_layout_signal_callback_del(), and elm_layout::signal_callback_del(). Referenced by elm_layout_signal_emit(), and elm_layout::signal_emit(). Referenced by elm_layout_sizing_eval(), and elm_layout::sizing_eval(). Referenced by elm_layout_sizing_restricted_eval(), and elm_layout::sizing_restricted_eval(). Referenced by elm_layout_table_clear(), and elm_layout::table_clear(). Referenced by elm_layout_table_pack(), and elm_layout::table_pack(). Referenced by elm_layout_table_unpack(), and elm_layout::table_unpack(). Referenced by elm_entry_entry_get(), elm_layout_text_get(), and elm_layout::text_get(). Referenced by elm_entry_entry_set(), elm_layout_text_set(), and elm_layout::text_set(). part_name a part from loaded edje group. part_name a part from loaded edje group, that had a cursor set with elm_layout_part_cursor_set(). func The callback function to be executed when the signal is emitted. data A pointer to data to pass in to the callback function. func The callback function being executed when the signal was emitted. part The table part name to remove child. part the box part to pack child. child the child object to pack into table. child The object to remove from table.